It’s rare for one piece of gear to completely live up to expectations. But the Stellar Moto Stratosphere jumpsuit exceeded my expectations — and more. 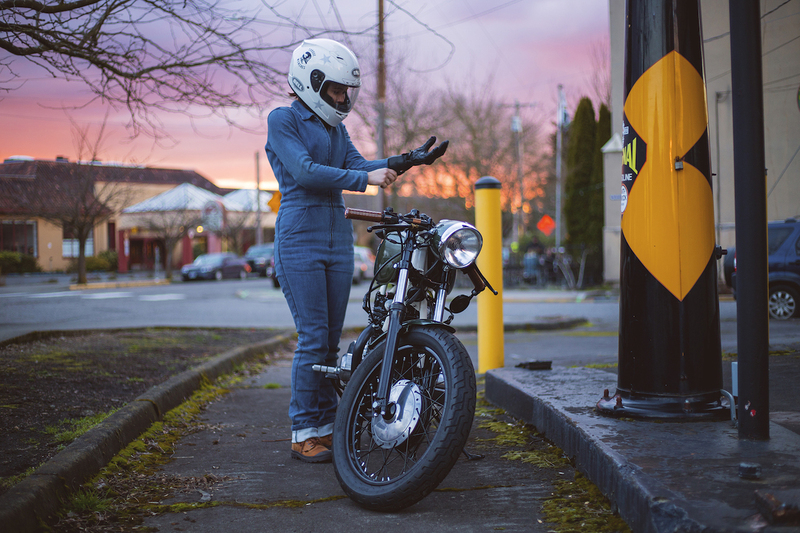 When I talked to Jenna last year about her new line of women’s motorcycle jumpsuits, she was rhapsodic. 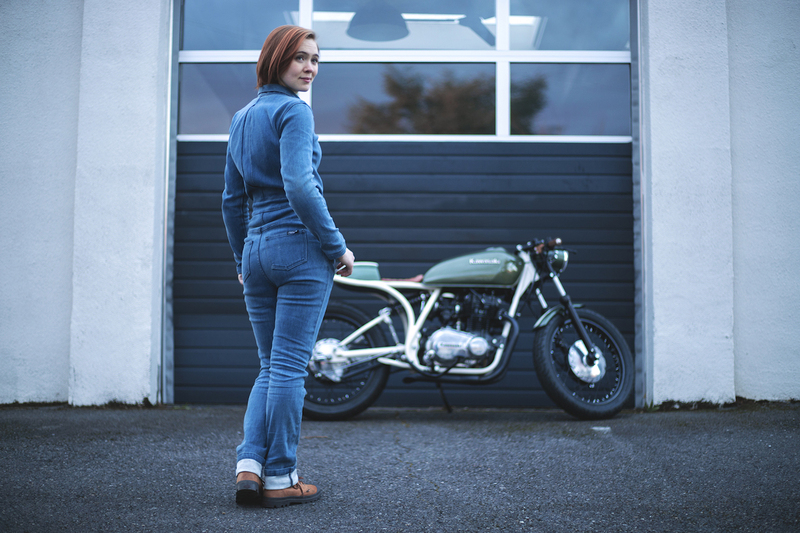 She gushed about the fit and fabric (52% Dyneema denim with 10% stretch), how well it breathes, how comfortable it is. Undoubtedly, Jenna set the bar high. Could she reach it? 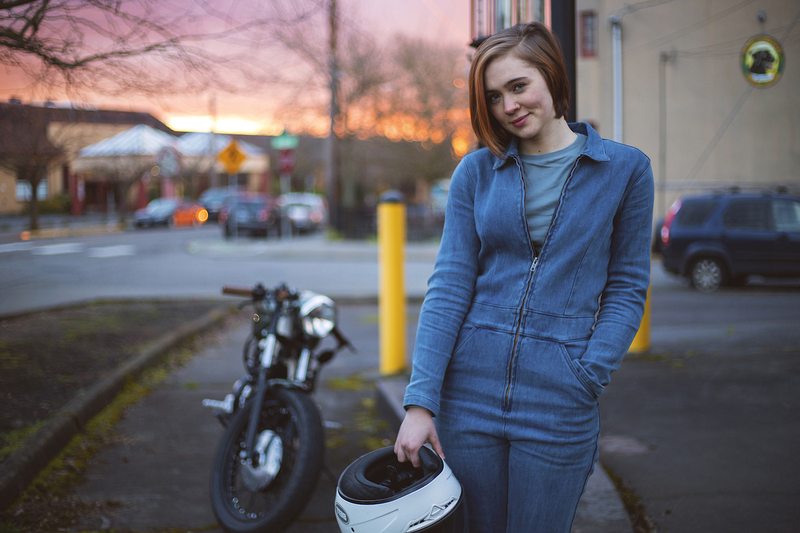 Months after our interview, Jenna came to Portland to do a fit pop-up, so I tried on the jumpsuit. I pulled it on over my thermal leggings (it was December) and… at first it was a bit tight. I told Jenna, and she told me to wear it for a few minutes, and then see how it felt. After about five minutes, the 10% stretch began to work its magic. The jumpsuit became as comfortable as my favorite yoga pants. I didn’t want to take it off. Three months later, I can confirm that the comfort holds up while riding. Even on a bike with an aggressive riding position like The Little Rat, it doesn’t ride up or bunch uncomfortably. As far as temperature goes, the fabric does breathe quite well. The jumpsuit is primarily Dyneema and cotton — both fibers with excellent heat conductivity. Standing in a 65 degree room, it won’t take long for you to feel a chill. As for style, this jumpsuit looks good on everyone I’ve seen try it on. Taller, shorter, thinner, stockier… It’s impressive, really. The Stratosphere jumpsuit doesn’t only excel in comfort and style. 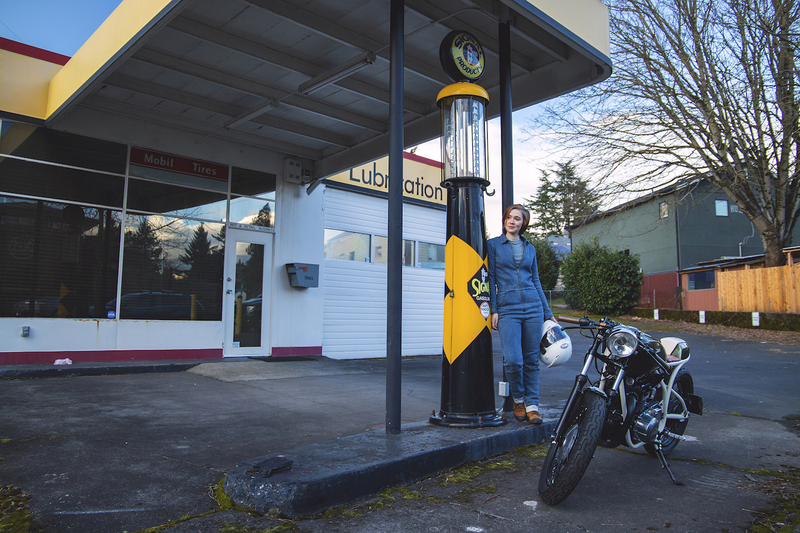 Jenna was on a mission to show that you don’t have to sacrifice protection to be cute and comfy on a motorcycle, so she didn’t cut any corners. The jumpsuit is made of a 52% Dyneema fabric, which is 15 times stronger than steel and used in several high-risk industries. It also has pockets for SAS-TEC knee and hip armor (included), and is made to be worn with an armored shirt. If you don’t already have an armored shirt, now is the time! Jenna has a mesh version available for riders in warm climates, and I love my Knox Armour armored shirt for cooler weather. 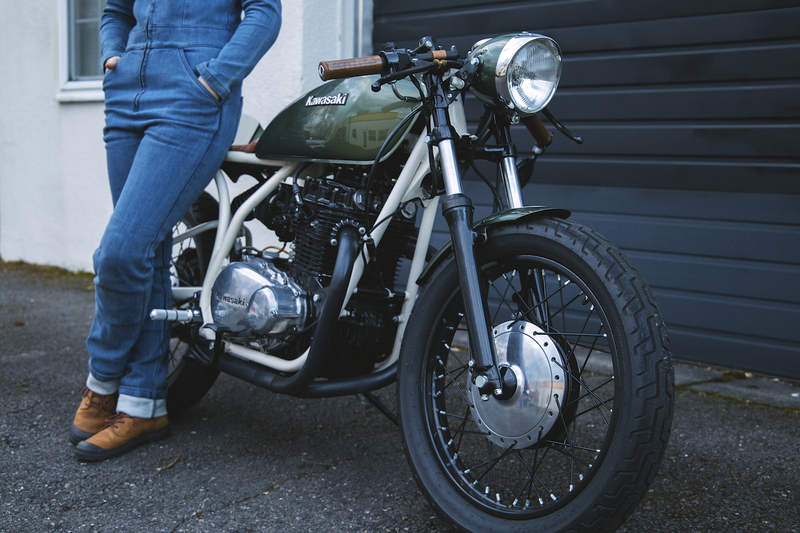 Not to mention, the jumpsuit format means you’re actually better protected than a typical jacket and jeans. 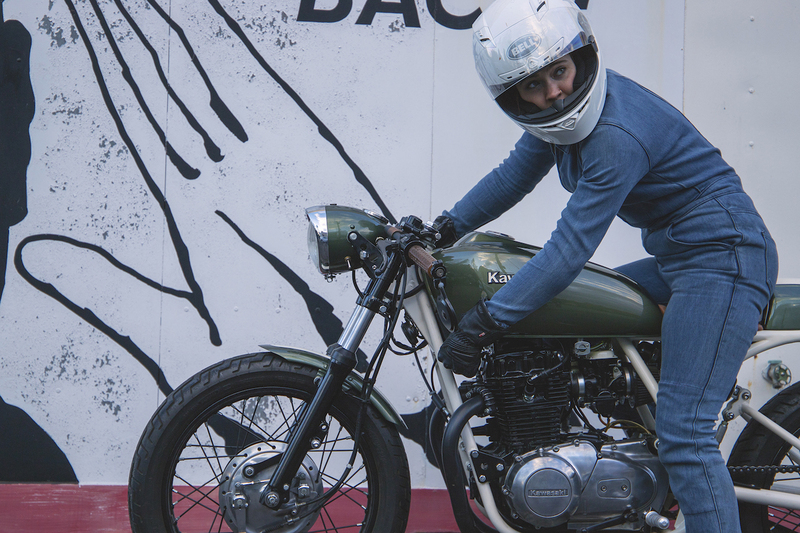 There’s no risk of your gear riding up or down in a crash and leaving your torso exposed. Add it all together, and you get a CE Certified Level 1 jumpsuit, with much more protection than any vintage-styled gear I’ve seen yet. Is the Stratosphere Jumpsuit Right for You? If there is a catch, it’s the price tag. At $850 ($975 with the armored shirt), this jumpsuit isn’t an impulse buy. 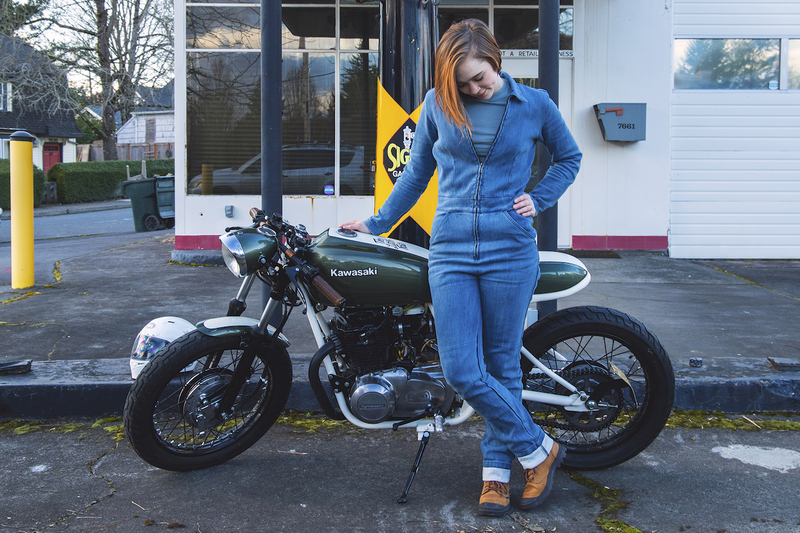 If you live in a warm climate, and you mostly do casual street riding, this jumpsuit was made for you. It costs as much as a quality jacket-and-jeans combo — with better temperature control, comfort, and (most likely) protection. You’ll wear it every day. But if you live in a cooler, wetter climate, you might not get as much mileage out of it. In temperatures less than 65, I need to wear a leather jacket and thermal leggings to stay warm. If that’s not a concern for you, then by all means go for it! 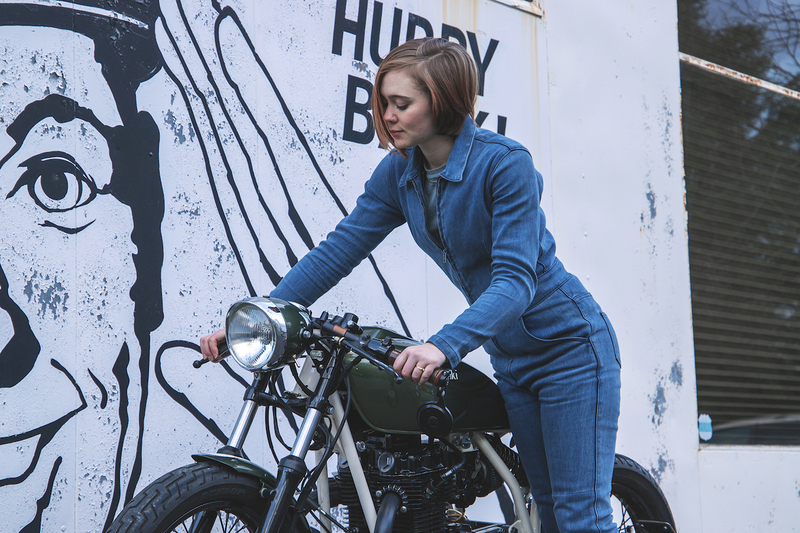 I can’t wait for summer rides in this jumpsuit. But if you’re not sure about spending that much on a fair-weather item of gear, don’t worry: Jenna has lots of ideas up her sleeves. Keep your eye on Stellar Moto, guys. They’re just getting started. Full disclosure: Jenna gave me a 50% discount on the jumpsuit, with no strings attached. I wrote this review because I wanted to, and all opinions within are completely my own. I tried on the Stratosphere Jumpsuit back in December and was an immediate fan. Comfortable, soft, protective fabric with knee and hip armor that’s so lightweight you don’t even notice it’s there. Jenna’s got a really good thing here. Can’t wait to see what she comes out with next! Yes! It’s quite impressive what she’s done, and after talking with her I know she’s got millions of great ideas for more awesome products! Her experience and passion make all the difference. Thanks for reading, Laura! A nice article with really good photographs. The photos greatly improved my understanding of the get it on / get it off process with the jumpsuit. Wouldn’t be a product for me even if it were made for men (never did like the way I look in jumpsuits); but the review is solid. Of course, I expected no less. Though I always appreciate full-disclosure, no bias was perceived by me – just some solid reporting. I wonder if Jenna takes custom orders … maybe for 10-year-old girls (hint, hint, Jenna). And thanks for the compliments on the photography, I passed them along to the photographer 😉 It helps that he has solid editing skills, as well! Yes, editing does help … everything looks better in post-production; but having a good eye (which he apparently does) is always a great start.